(Fantastic Four III#541) - Shortly after the Thing got off a plane from the United States to Paris, France, he began looking for a place to get some good food. Les Heroes de Paris' commander in absentia, Adamantine, disguised as a humble souvenir vendor, saw the Thing and suggested the Thing visit le Rose et la Plume restaurant for food. Later, as the Thing was enjoying a cup of coffee at le Rose et la Plume, the floor opened up and lowered the Thing into the secret headquarters of les Heroes de Paris, where Adamantine revealed his true nature as a superhero. Informing the Thing that Paris was in danger, Adamantine quickly introduced the Thing to the other members of les Heroes de Paris before the Thing asked what the problem was. When the Thing asked about government agencies preying on their own people, big multinational conspiracies or a war of heroes, les Heroes de Paris looked at each other confused, then Adamantine explained that their enemy, l'Empereur du Monde Souterrain had assembled an army of rock creatures to destroy Paris. Fondly remembering the good old days before America's superhero Civil War, the Thing asked what he could do to help and Adamantine explained that when they met their enemy, the Thing's role would be clear. Shortly after, the Thing aided les Heroes de Paris against l'Empereur du Monde Souterrain's rock creatures. As the rock creatures broke onto the Paris shore, Adamabntine ordered Anais and le Docteur Q to get through the gap before rock creature reinforcements could arrive. While the two heroes did just that, the Thing and Detective Fantome fought side-by-side, with the Thing asking about Detective Fantome's prowling around the Louvre at night. When l'Empereur du Monde Souterrain burrowed his way to les Heroes de Paris' underground location, le Vent hurled the Thing at superhuman speed onto l'Empereur du Monde Souterrain's Great Machine, where the Thing and the villain met face-to-face. After l'Empereur du Monde Souterrain announced that Paris deserved to fall, as it gave nothing but pain, the Thing quietly asked if l'Empereur du Monde Souterrain had been turned down for a date, to which the villain replied "maybe." The Thing then explained that just because l'Empereur du Monde Souterrain had been hurt did not mean he could go destroy a city and the hero then began destroying l'Empereur du Monde Souterrain's Great Machine, causing a cave in and les Heroes de Paris were forced to escape. Once they had all made it out of the cavein, the Thing emerged, carrying l'Empereur du Monde Souterrain under his arm. When les Heroes de Paris went back above ground, l'Empereur du Monde Souterrain's lover Louise ran up and exclaimed that she could believe all that l'Empereur had done for love. L'Empereur du Monde Souterrain then proposed marriage to Louise, who accepted. Adamantine then announced that it was time for dinner, prompting the Thing to reply that he felt like it was the beginning of a wonderful friendship. (Fantastic Four III#542) - After le Docteur Q discovered a secret Hydra base in Paris, the Thing and Anais ventured in the Paris Catacombs in an effort to sneak into the base. Suddenly, Hydra agents swarmed the two heroes, who made quick work of the Hydra agents. Upon turning the Hydra agents over to the authorities, Anais began strongly flirting with the Thing, who tried to explain that he was seeing someone. Anais then kissed the Thing but fled when the Thing's teammate, the Human Torch, arrived in Paris in the Fantasticar and explained to the Thing that Mr. 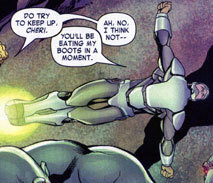 Fantastic had something to do with the cybernetic Thor clone that had killed the Thing's friend, Goliath. Human Torch then asked the Thing to return to the United States, leaving part of the Fantasticar behind for the Thing to use. (Civil War: Battle Damage Report) - France was ill equipped to handle the influx of American superhumans fleeing the Superhuman Registration Act. Although helping to stem the rise of super-powered refugees illegally entering the country, les Heroes des Paris lacked sufficient resources, so France had to contract mercenaries. (X-Force IV#4 (fb) - BTS) - Anais and le Comte de Nuit left les Heroes de Paris to join France's secret spy group, le Bureau Discret. Comments: Created by J. Michael Straczynski, Mike McKone, Andy Lanning, Kris Justice and Cam Smith. In X-Force IV#4, Anais and le Comte de Nuit were seen as part of a new French super-team, le Bureau Discret. A female character called Capitaine Fantome was also shown as a member of le Bureau Discret and could possibly be related in Detective Fantome in some way, given their similar pink, smokey appearances. Given Detective Fantome's origins as an avenging spirit doing good until he could uncover the mystery of his own murder, perhaps Capitaine Fantome was also resurrected as an avenging spirit in a similar way, like the Spirits of Vengeance that have created the Ghost Riders throughout generations. Also, it was not explained if le Bureau Discret was a team that replaced les Heroes de Paris or if Anais and le Comte de Nuit simply left les Heroes de Paris to join up with le Bureau Discret. 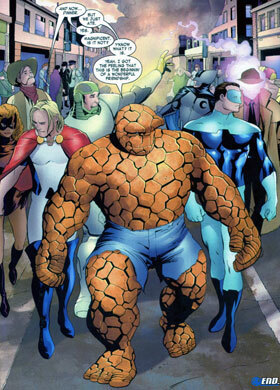 In the team members' introductions in Fantastic Four III#541, it was stated that la Lumiere Bleue prowls the Louvre museum at night like a phantom but during the later battle against l'Empereur du Monde Souterrain, the Thing asked Detective Fantome about his prowling around the Louvre at night. Therefore, either both la Lumiere Bleue and Detective Fantome prowl around the Louvre (which is how I listed it in the profile...perhaps Adamantine set the Louvre as both heroes' patrol areas?) or it was a writing error in the issue. 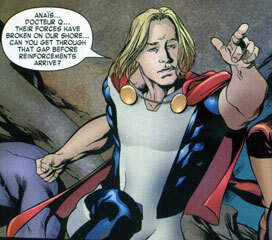 While Adamantine's powers were not fully explored in his one appearance (he was shown punching a rock creature and flying), he was listed as being indestructable in France's entry in the Marvel Atlas#1. CW:BDR entry by Grendel Prime. Adamantine was the commander in absentia of les Heroes de Paris and often disguised himself as a souvenir salesman in order to keep tabs on events in Paris. When the Thing arrived off a plane from the USA, Adamantine (in his salesman disguise) suggested the Thing visit le Rose et la Plume restaurant for good food. Once there, Adamantine had the Thing lowered into les Heroes de Paris' secret headquarters beneath the restaurant. Explaining to the Thing who he was, Adamantine then introduced the Thing to the other Heroes de Paris and explained to the Thing that l'Empereur du Monde Souterrain had assembled an army of rock creatures to destroy Paris. Later, Adamantine led les Heroes de Paris underground against l'Empereur du Monde Souterrain's forces and after l'Empereur's defeat, Adamantine announced that it was time for dinner. Adamantine had superhuman strength, sufficient enough to battle hand-to-hand with creatures made of solid rock, and could fly. He was also indestructable by conventional injury. Le Cowboy was Paris' homage to the American West, taking an Old West theme to his heroic identity. As a member of les Heroes de Paris, le Cowboy aided the team against l'Empereur du Monde Souterrain and afterwards accompanied his teammates for dinner. 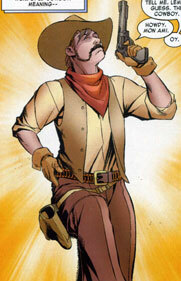 Le Cowboy did not appear to possess actual superpowers but carried a gun into battle. Detective Fantome (French for "The Phantom Detective") was a human ghost who was forced to wander the Earth, aiding the others until he could one day solve his own murder. Once his murder was solved, he would be able to enter Heaven. Until that day, Detective Fantome spent his nights prowling the Louvre art museum in Paris, hoping to undercover mysteries. 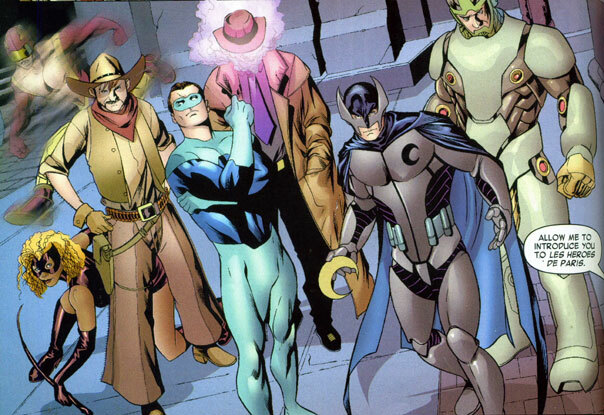 As a member of les Heroes de Paris, Detective Fantome aided the team against l'Empereur du Monde Souterrain, where the team's ally, the Thing, asked about Detective Fantome's Louvre prowling. When the Thing asked Detective Fantome if he had found any secrets or mysteries, Fantome replied that if he had, he would no longer prowl, prompting the Thing to joke that, even in death, Detective Fantome couldn't hold down a steady job. Detective Fantome then called the Thing as "bourgeois capitalist" and was met by the Thing's "socialist layabout" insult, prompting Fantome to angrily exclaim that the dead were entitled to lay about. 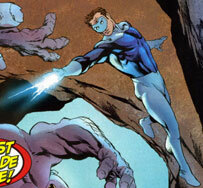 The Thing then told Fantome to "stuff it" before continuing the fight against l'Empereur's rock creatures. Upon l'Empereur's defeat, Detective Fantome accompanied les Heroes de Paris for dinner. Detective Fantome existed as a ghost, apparently made of a smoke-like, ethereal substance. Le Docteur Q was once one of the world's greatest scientists and turned his extensive knowledge and personally designed arsenal toward peace as a member of les Heroes de Paris. Aiding les Heroes de Paris against l'Empereur du Monde Souterrain's rock creatures, le Docteur Q accompanied the team for dinner following l'Empereur's defeat and later learned of a secret Hydra base in Paris, sending the Thing and Anais into the Paris Catacombs to infiltrate the base. Le Docteur Q wore a sophisticated suit of armor of his own design that was equipped with boot jets and presumably other weaponry. La Lumiere Bleue (French for "The Blue Light") also prowled the Louvre art museum at night, using his "light of truth" to undercover hidden secrets. As a member of les Heroes de Paris, la Lumiere Bleue aided the team against l'Empereur du Monde Souterrain's rock creatures and, upon l'Empereur's defeat, joined les Heroes de Paris for dinner. La Lumiere Bleue could project bright blue energy from his hands that could "reveal all secrets" and fly. 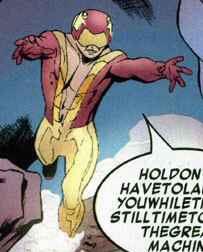 Le Vent (French for "The Wind") gained his superhuman speed powers from a sorcerer who cursed le Vent, leaving him incapable of slowing down to normal speed. Le Vent became known as the fastest man in Europe and used his powers as a member of les Heroes de Paris, whom he aided against l'Empereur du Monde Souterrain and his rock creatures. During the battle, le Vent grabbed the Thing and hurled him at superhuman speed onto l'Empereur's Great Machine, allowing for l'Empereur's defeat. Following l'Empereur's defeat, le Vent accompanied les Heroes de Paris for dinner. Le Vent uncontrollably moved at superhuman speed (sufficient to match an airplane at Mach Four) at all times.